Back in June, I dropped our oldest daughter off at her girlfriend's house for a pool party. They had the COOLEST giant Jenga game setup on the deck next to their pool. I came home and told my husband I just had to have one for our pool deck. I had never seen one before, but after some research, the idea is actually all over Pinterest. But here is our overview of that simple (and extremely repetitive) project. Todd even pulled in our daughters to help as well and they really enjoyed getting to use power tools. The game is basically sixty 10.5" long 2 x 4's. Sixty boards are stacked three per row, for a total of 20 rows high. This was the most repetitive project! Every board gets measured, cut, sanded and stained. Here are the rough cut 10.5" boards. Then, each board gets the edges rounded with a belt sander. 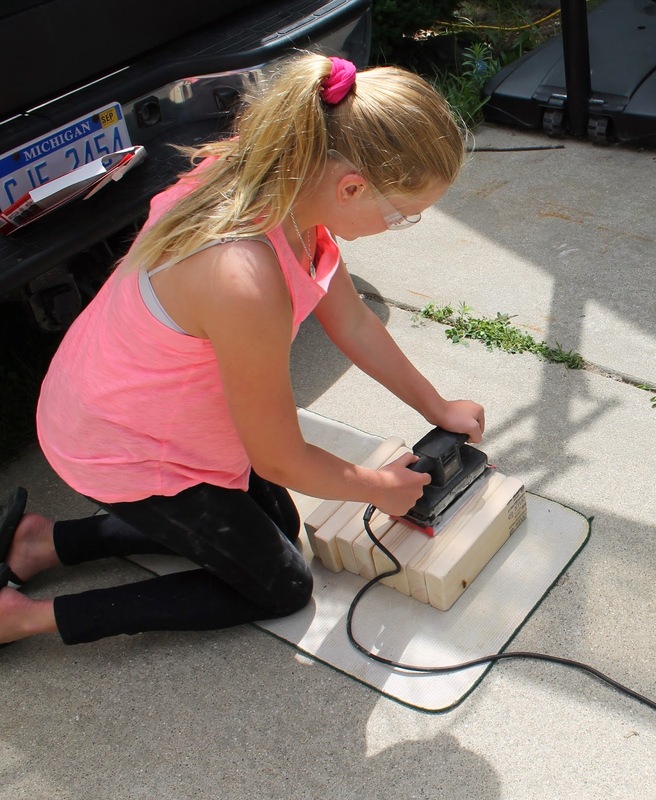 My belt sander is held up by my vice so that our daughter could sand easily. Our oldest then sanded each board with a finishing sander. And then we stained each board with linseed oil. I think the oil gave it a nice finish, don't you? 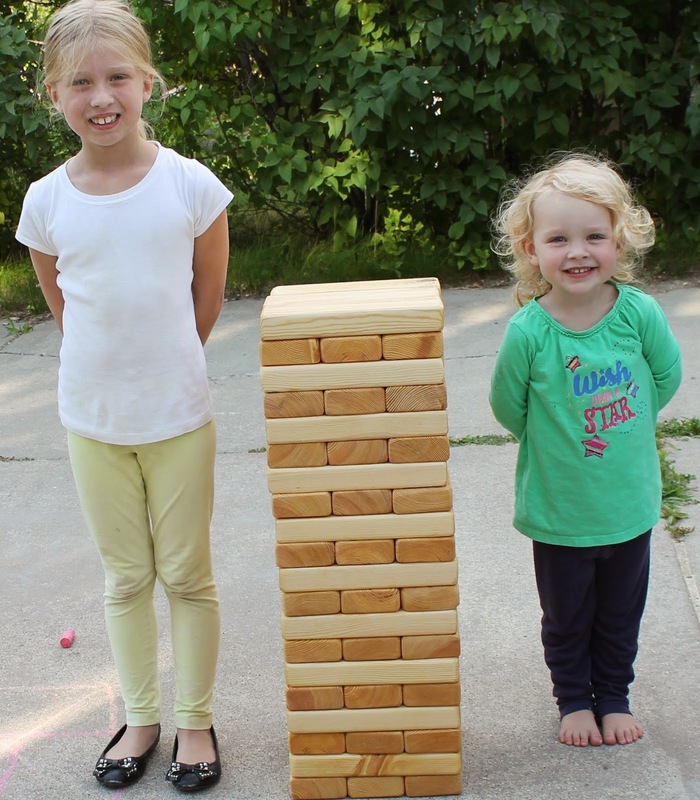 We constructed this game from standard pine 2 x 4's and used a total of 8 boards, including a few mess-ups and waste from knots in the wood. 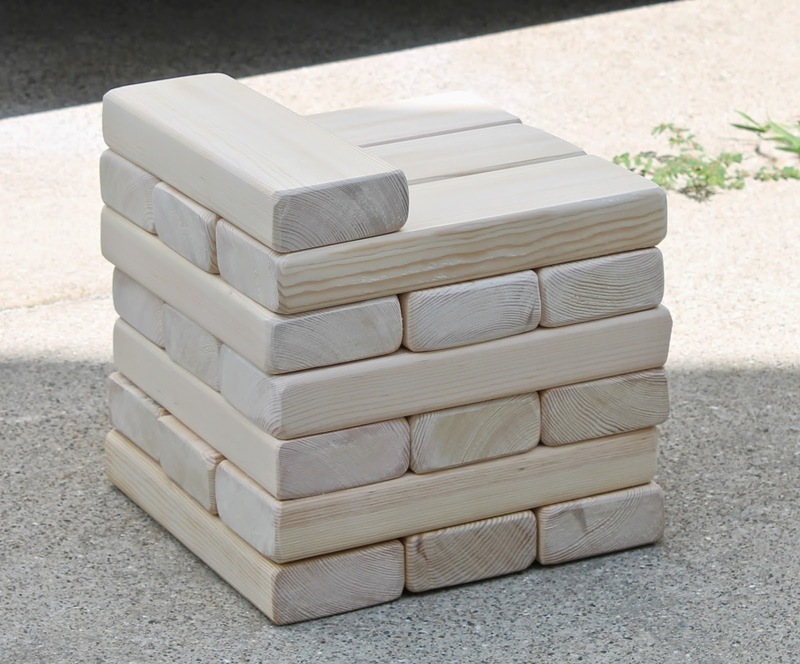 We spent about $40 total on the game including some sand paper and the linseed oil to stain the wood. If you are looking for an easy and fun project this is perfect! It was a blast to build and the girls really enjoyed putting it together.